Bring the flavor of Steininger's home. Measure milk into a deep pan and drop in the butter pieces. Set the pan over heat and warm gently until all the butter has melted, then raise the temperature and bring the liquid to a rolling boil. Draw the pan aside and add the flour/sugar mixture all at once. Beat vigorously with a spoon and quickly replace the pan over low heat. Continue beating and cooking the paste for just a few seconds more so that the flour is properly combined. The paste should have an ungrained, smooth appearance and roll cleanly off the bottom and sides of the pan into a ball. Avoid over-cooking the paste or the finished buns will be heavy. Leave to cool about five minutes. The mixture may now be beaten in the bowl of an electric mixer as the eggs are added. Care must be taken as too much egg can spoil the paste making it too runny, so add a little at a time. Lightly whisk the eggs together in a separate bowl and pour about a quarter on the flour paste, beat vigorously until well combined; add more egg and beat again. Continue adding egg and beating, until the paste is firm, but elastic. Beat the paste well until it is shiny and smooth; finally add the rum. The paste is now ready for use and may be kept for an hour or two if covered with a damp cloth. Place teaspoons full of the mixture, about 1 inch high and 2 inches apart onto a baking sheet. Bake at 400 degrees until golden brown, approximately 20 minutes. When fully baked remove the rolls from the oven and poke with a large fork to let the air escape. These delicious rolls can be slit and stuffed with such delights as whipped cream, Bavarian cream, or whatever strikes your fancy. 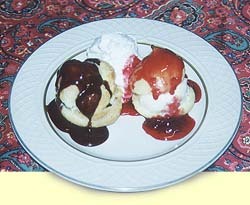 Here we show them served with ice cream, one topped with our Chewey Fudge Sauce and the other with our Raspberry Sauce. Enjoy! Put a little pizazz into an old classic by adding some of our Blueberry Chutney to your next grilled ham sandwich. Using sweet butter, butter one side of 2 slices of Jewish or Marble Rye bread. Place them butter side down on a hot griddle. Place cheddar on one slice and Blueberry Chutney on the other. Grill ham and then place on top of chutney. Place cheddar slice on top of ham and voila! A great sandwich that is simple to prepare and a joy to eat.